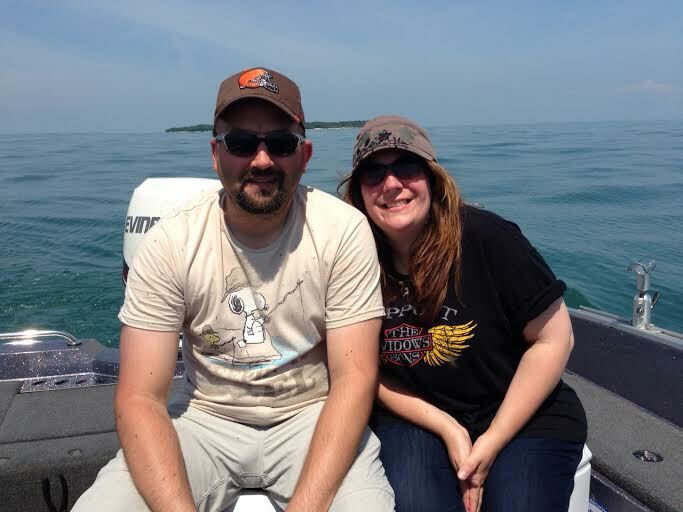 I just wanted to let you know that Stacy and I had a great time fishing with you last Saturday. The bugs were the only bad part, but that is how it goes. Stacy had a lot of fun catching perch she keeps talking about it and telling everyone. It was only her second time ever fishing for perch. I really appreciate your patience in showing us how to hook up the off-shore boards. I have never done that before and it was great to learn. We will definitely be getting in touch with you again next year for a trip. Oh yes sorry for not turning the clickers off when I was reeling fish-in (ha). Thanks for the browines to they were really good. Have a great rest of the season and be safe on the water. My friends Mark and Dee and I fished with Juls last wednesday june 24. We postponed one day due to weather. It was an interesting day for sure. Ill start with a comment we overheard from another angler (guide?) directed towards Juls as we were pulling back in to Mazurik's after 4 hours, though we had booked for 8 hours. "What did you figure out that we couldnt?" To me, that speaks volumes as to the quality guide service you'll get from Juls . She figured it out after the lake was turned on it's ear. And in short order too. Ramp to ramp in 4 hours, motoring to/from Canadian waters mind you, 4 limits in the box. BAM!!! AND 6 CATFISH. WOOO HOOO?????? More on the cats later. We motored across the border, came off plane, set lines and started catching fish. The next time we fired up the 300 eTech was after the last keeper hit the box and we were headed back in. Action was steady with a few doubles thrown in. Junk fish were not really an issue with a sprinkling of white bass, sheepshead, and catfish. Oh wait! After the first cat came to the net both Dee and Mark declared catfish are not to be considered junk fish. In the cooler they went. Did I mention Dee hails from Arkansas? And he's **** proud of it and of his catfish, They seemed to be just as, if not more than, enthused over the cats. They were like kids on Christmas morning when Juls said they could keep the cats. Yeah all 6 of them. Juls was politely accommodating She was with teaching a couple of guys who'd never trolled before. In doing so she managed to net Dee's first ever walleye. He was loving it. This also was Marks most productive day ever walleye fishing. My second time fishing with Juls had Mark and Dee quickly realizing why I wanted to book her again. Seriously not just the limits in the box. The professionalism. The equipment. All top notch, clean and well maintained. The calming guidance to the new trollers: " Back up between the seats!" "Get in the corner!" "Rod tip down!" She knew to speak in short sentences and terms they'd surely understand. Again signs of a pro. Knowing how to adapt to a situation. And Juls' offering the extra brownies just turned Dee, a man of over 50 years of age, into a giddy little school girl. If it's not obvious, we had a GREAT time. Cant wait to return. We (my wife and I) were lucky enough to have our 6 hour trip scheduled with Juls on Friday, June 26. I set this fishing trip up months ago as it fit well with our travels back to our home in Iowa after spending some time out east in New York state (for a wedding) and hitting Boston and Cape Cod. I always wanted to fish Erie and this was my opportunity! Glad the weather let us get it in, with the big blow coming in on Saturday we would have missed out altogether on my opportunity. We headed out at 6AM and the "seas" were pretty calm with 1' waves for our trip up to the east side of Pelee. Juls gave us the planer board, worm harness baiting, and rod/rig setting education and we were fishing! We had a walleye on before all the rods were set (woo-hoo), we quickly had the "landing a fish routine" training! Things went quiet for awhile and the next fish we hooked up with really dug and fought like a big walleye, but as it came to the net it was a 8-9 pound catfish. I admit it, I'm a walleye fanatic and was disappointed at it being a catfish (okay, I'm a species snob!). But it was fun fight! To cut to the chase, we worked the area all morning and ended up with 8 nice sized walleye. There was an assortment of white bass and sheephead to keep us busy. As we listened to the radio chatter between boats we heard a lot of reports of; "we have one in the box", "we have 3 in the box", etc. So, our 8 sounded like a pretty good day. The wind kept building all morning long, so by the time we headed back to the launch we had the thrill to chase 3' to 5' waves back in! We just "rode" them, glad we were going "with them" versus "against them". Juls was really fun to fish with and extremely organized and persistent to fish in the boat. Plus she was very patient and accommodating in answering all my inquisitive questions about using and setting up planer boards, something I was very much looking forward to "learn" about. The famed "Juls brownies" were fantastic, since her regular brownie pan was dirty our batch were baked in a muffin pan, a real treat (at lest for me!) as every brownie was a "edge" piece with "crust-like" edges! 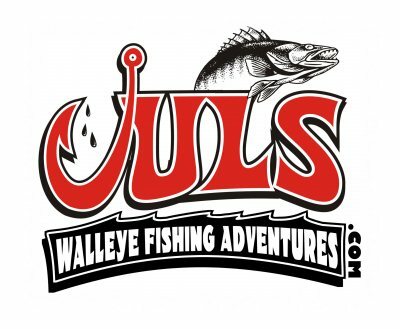 Thanks Juls for making our first Erie walleye experience a great one! ​My Dad and I fished Lake Erie for almost 30 years, mostly fishing out of Put-In-Bay. Due to my Mom’s declining health, my Dad sold his boat. 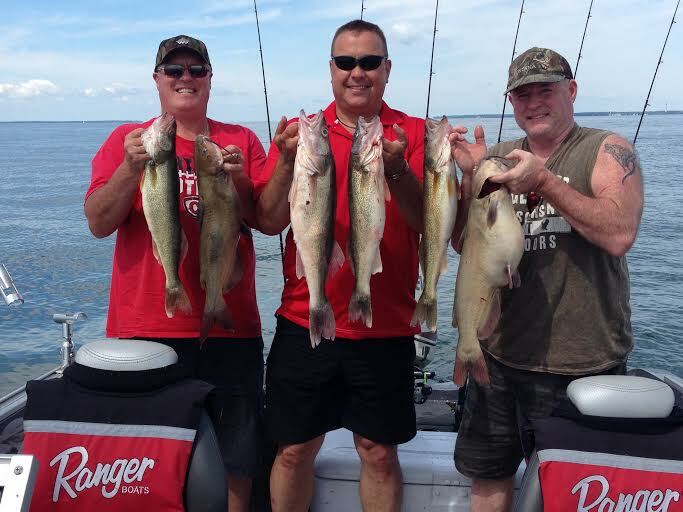 We love walleye fishing and Lake Erie is part of our soul after so many fishing trips to the Islands. On two prior occasions, my Dad had tried some conventional charters that relied on larger 25-30 ft Sport Craft-type boats that kind of ruined the sporting side of the fishing experience, especially for my brother-in-law and nephews who had never fished Erie before. However, we followed Captain Jul’s posts as moderator of the Walleye Central forum of fishing reports for W Lake Erie and were intrigued by her small party focus that involved using cutting edge equipment. We missed our opportunity for a fall trip with her in 2016 due to bad weather but she saved our deposit and we set up a trip for mid-June as a Father’s Day trip. In 2015-16, my Dad had battled back from Stage IV cancer treatment and this trip was meant to be memorable. Wouldn’t you know, right before our trip date, Ohio experienced the first heat wave of the summer AND the mayflies began to hatch! It was clear from fishing reports on the Internet that catch rates were going down as the mayfly hatch increased. Most of the reports indicated that fisherman were only catching younger year classes. We were nervous because we had experienced these issues before ourselves. These challenges didn’t stop Captain Juls. She kept track of the bigger fish and encouraged us to bring our passports so that we could take advantage of the hot fishing on the Canadian side of the Lake where the mayflies were not as numerous. We were scheduled for an 8-hour charter but had our limit in just over 4 hours!!! The fishing was steady despite the warmer temperatures, bright sun, and low chop on the water. Nonetheless, we had 4 fish over 6 lbs with the largest pushing 9.5 lbs. 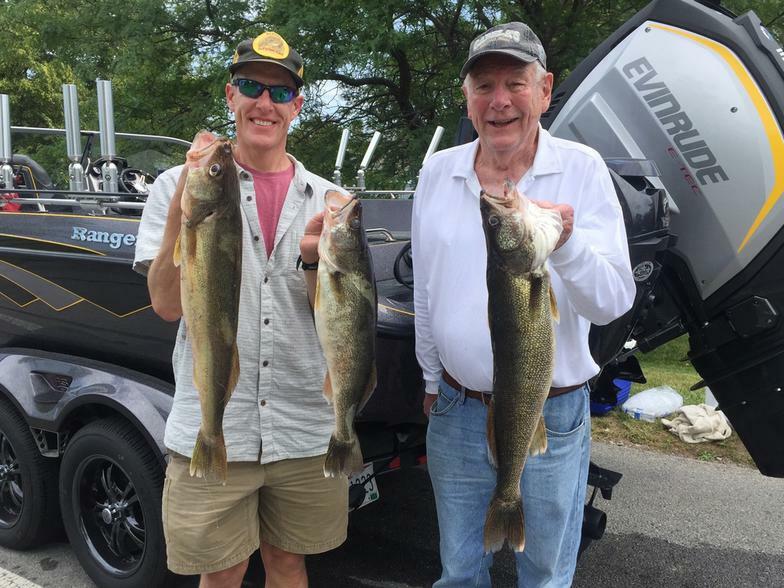 My Dad and I thought we knew a lot about fishing for walleyes on Lake Erie but Captain Juls is a real educator- a real walleye pro. She put on a clinic showing us the nuances of trolling with planer boards, spinners, and using her electric trolling motor to approach the fish in a stealthy manner. She was patient with us and coached us to avoid some basic errors in reeling in fish with planer boards. She went out of her way to offer a real fishing experience including providing her own homemade chocolate brownies and soundtrack of songs that really kept the morning humming. Juls pays attention to the small details that make a trip great at the end of a day. She took better pictures of our fish than we did and sent the photos to us before we even left Mazurik's. She also gave us great recommendations for fishing cleaners so that we didn't have to drive all the way home to clean our fish. Fishing can be a hit or miss sport due to weather and uncontrollable variables but Captain Juls really provided us with a first-class experience. For that I’m grateful and now consider myself a loyal client going forward.